Journey back in time through this riveting, family-friendly exhibition of artifacts from the 'Titanic' on display at the Luxor Hotel and Casino on the Las Vegas Strip. See more than 250 authentic items from the sunken ship, including a large piece of its hull, passenger luggage and an unopened bottle of Champagne. 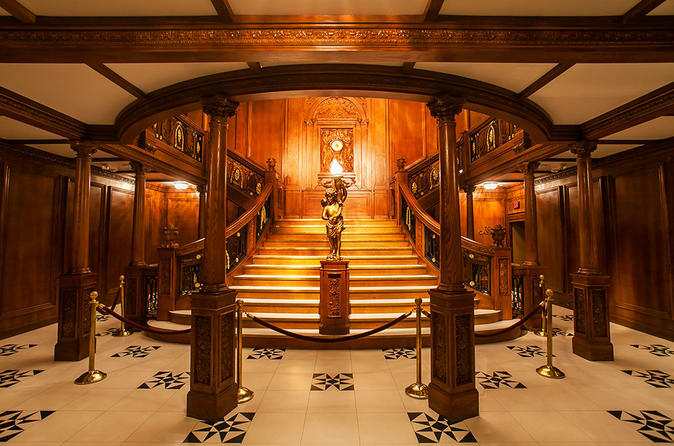 Also, explore meticulous replicas of the ship's cabins and its Grand Staircase. Through the historical displays, you'll get a feel for the opulence of the ship and learn what led to its sad fate. Head to the Luxor Hotel and Casino in Las Vegas, and use your admission ticket anytime during the long open hours of Titanic: The Artifact Exhibition. Then immerse yourself in the dramatic, poignant history of the doomed luxury ocean liner, once thought to be unsinkable. Viewed by millions of people all over the world, this moving exhibition contains 250 authentic artifacts recovered from the wreckage of the ship after it struck an iceberg in the North Atlantic Ocean and sunk during its 1912 maiden voyage. See recovered items including luggage, jewelry, china, ship's whistles, floor tiles, an unopened bottle of Champagne and a huge section of the ship's hull. Explore replicas of the first- and third-class cabins — complete with furnishings from the original manufacturers — and the ship's Grand Staircase. Through educational displays, learn about the construction of the luxury ship; the series of events that led to its destruction; and the personal stories of the men, women and children who were aboard. Less than half of them survived when the Titanic sank. Explore this fascinating, memorable exhibit at your own pace, and learn the true story of what happened to this most famous of ships that long-ago spring night.